Jon and I are a little proud of ourselves for waiting more than three weeks to go out to eat for the first time. 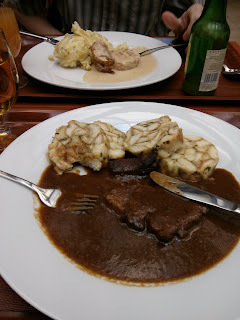 Behold our delicious Czech food. I'm not counting the Swedish Meatballs at Ikea or the Euro Hotdogs (sausages in hollowed-out rolls) that the older boys and Jon got from a stand the other day. Anyway, it was very good. Mine was some kind of meat with Knedlíky, a bready dumpling, and Jon's was chicken rolled around bacon with some of the best potatoes I've ever had. We managed to carry out the entire transaction in Czech, too, thanks mostly to Jon and to the staff, who smiled a little to themselves and were patient with us instead of switching to English. It's very possible that I ordered using a couple of descriptive words, because the name of what I got was really long. I'm okay with making lots of mistakes, though. Trying to speak perfectly is a huge obstacle to learning a different language, so I've made my peace with sounding like an idiot. Unfortunately, I don't think that's the only requirement for learning a new language. Waiting to go out to eat was partly a money-saving trick. I've been cooking at home a lot, more than I've done for several years. It's not that we went out to eat a lot at home, but we often ate things that were quick to prepare, or I'd have the kids make something. I'd be more descriptive, but I can't think of anything we ate frequently at home right now! (Chips and salsa was one staple.) Lunch was usually sandwiches or quesadillas -- the younger kids would eat quesadillas or grilled cheese sandwiches for every meal, if I let them. I probably cooked once or twice a week, and when I did, I made sure there were plenty of leftovers. Now I'm cooking every night and trying not to have leftovers. We've eaten goulash a few times, one of our favorite things from our missions in East Germany. Otherwise, I've made a lot of soups and pasta. For lunch we eat bread, meat, cheese, and fruit, or sometimes just bread and cheese if we are low on groceries. Jacob's latest favorite thing is bread with tomatoes and Camembert cheese, which is cheap here. There's no Cheddar cheese. Instead, the most ubiquitous cheese seems to be Edam, which is quite good. The kids miss peanut butter. I haven't even looked for it yet. If we do find it, (it was nowhere to be found 20 years ago), I'm guessing it will be expensive. Good chocolate is cheap -- the store brand at Kaufland is about 50 cents for 100 grams. I think the equivalent would be at least $2.00 in the US. Milka, the yummy German chocolate, is a little over $1. This messes up my plan to lose weight by walking a lot. I was sort of wondering why you gave me the peanut butter you had instead of stashing it away in some bag somewhere. Maybe there was no room. But, YES, I would miss peanut butter. You can have the peanut butter if I can have the bread, cheese and chocolate! !